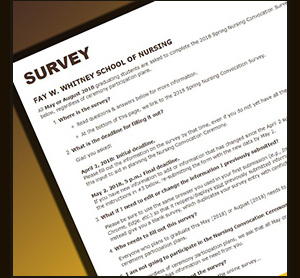 All May or August graduating students are expected to complete the spring Nursing Convocation Survey linked below, regardless of ceremony participation plans. All December graduates wishing to participate in the Nursing Convocation Ceremony in the spring following their fall graduation are also expected to complete the survey. Read questions & answers below for more information. At the bottom of this page, we link to the 2019 Spring Nursing Convocation Survey. What is the deadline for filling it out? Please fill out the information on the survey by that time, even if you do not yet have all the answers. We need this input to aid in planning the Nursing Convocation Ceremony. If plans change from original submission, please complete and submit a new survey right away, but preferably no later than this date to better assist us with ceremony planning. The School of Nursing will use the information to plan the Nursing Convocation Ceremony so that we know who is attending in order to accommodate their presence. The School of Nursing will use the information to generate a Convocation Reader Card. Students planning to attend will pick up their card prior to the ceremony (as noted on Nursing Convocation: Ceremony Detail & Expectations page). Faculty read the card for each graduating student as they are on stage during the presentation of graduates during the ceremony. Photographers will have card copies as well for correct spelling of your name and contact information for sending individual pictures. For those NOT participating, we would love to know about your plans for after graduation as well.